I still have a few spots open for September sponsorship. Email me thelifeofbon@gmail.com in August to receive 25% off. Book club time! BOO YAH! SIDE NOTE: Make sure you pick up a copy of Eleanor and Park for September's book discussion on September 25. It's all the rage with the young kids nowdays. I have heard so many things about this book and I'm anxious to dig in. (Parents at my school were up in arms after it was assigned for summer reading in a ninth grade honors class- can't wait to see what all the fuss is about!) In fact, I am totally stoked for the four remaining books in the year- all four are ones I have heard great things about and have been excited to read. If you haven't joined in book club yet or got too busy over the summer, it's okay! Jump back in for the fall- there are some fantastic books lined up! A brief summary- in February of 2009 (2008?) Cahalan, a reporter at the New York Post starts to go mad. She hears voices, imagines people are stalking her, and suffers from seizures. After a month in the hospital with her condition getting worse and no diagnosis whatsoever, the miracle doctor, Dr. Najaar, figures out that she has an autoimmune disease- her brain is swelling and is under attack from her own body. After she is successfully diagnosed (she has to undergo a brain biopsy to confirm the suspected diagnosis) she is able to get treatment (which involves steroids, plasma transfusions, and something else I can't remember) and within time returns to her normal self. The first 2/3rds of the book was really tough on me. The first third is all about her descent into madness. I struggled with it mostly because I felt like it was the same thing over and over. "I heard voices. Someone was following me. I had a seizure. The hospital didn't know what was wrong with me." I understand that for her each detail was important, but to me it just got very repetitive. And I also started to feel like I was going mad. The second third of the book is about her month in the hospital and the attempts to find a diagnosis and cure. This is where I really almost quit on the book because it got so technical. I am not a medical student, nor am I terribly interested in the nitty gritty details of how the brain works, what diseases mean what, what each test does and measures. I got lost in the technicalities, and I felt like the actual story telling suffered as a result. Most of this month Cahalan has no memory of it, so it was a lot of "the doctors said this" "my dad told me that this happened", etc. I was reading a second hand account of the events, and I didn't love it. I ended up doing a lot of skimming during this part of the book. "Someone once asked, "If you could take it all back, would you?" At the time I didn't know. Now I do. I wouldn't take that terrible experience back for anything in the world. Too much light has come out of my darkness." What stuck out to me throughout the entire course of the book is the support that Cahalan had from her family and boyfriend. If anything, I thought the book was a testament to the power of family and relationships. Her dad was with her all day every day in the hospital and her mom visited every day after work. Her parents came together for their daughter despite a history of avoidance due to a rocky divorce. 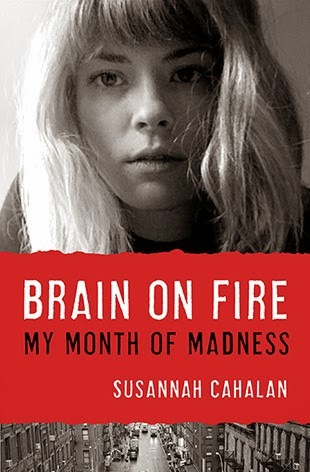 Cahalan talks a lot about the toll that her disease had on her family and it was fascinating for me to read how each of them dealt with the trial. Her boyfriend, whom she had only been dating a few months at the time that she contracted the disease, came to the hospital every night to watch tv with her and essentially functioned as a caregiver to her. What a guy, huh? At times the writing was a little tough for me. Cahalan is a reporter and the book often reads like, well, a report. I wanted it to have a little more storytelling quality to it, not so much just a presentation of facts. One of the most interesting parts about the book was its explanation of memories and how are memories are made, preserved, changed, etc. This is an interesting explanation as to how two people can remember the same event differently. "When a memory is recalled, it's essentially remade, allowing new (and sometimes wrong) information to filter in. This is normally useful because we need to be able to update our past experiences to reflect present information, but it sometimes creates devious inaccuracies." "When the brain is working to remember something, similar patterns of neurons fire as they did during the perception of the original event. These networks are linked, and each time we revisit them, they become stronger and more associated. But they need the proper retrieval cues- words, smells, images- for them to be brought back as memories." So when we remember something, we are, in essence, reliving it because similar patterns of neurons fire as they did during the actual event. I think this is why I like writing so much- I have always felt like it allowed me to experience things twice, and turns out it really does! "The girl in the video is a reminder about how fragile our hold on sanity and health is and how much we are at the utter whim of our Brutus bodies, which will inevitably, one day, turn on us for good. I am a prisoner, as we all are. And with that realization comes an aching sense of vulnerability." I can't wait to hear what you all thought of the book. Was it too "technical" for you? Did it scare you? What people in the book did you most identify with? Leave your comments and/or links to your own post on the book and let's get talking! i can't say I agree with you on the first two thirds of the book. I started reading at 5pm and finished the book six hours later, didn't put it down once. That's how much I liked it. I got sucked in and I couldn't get out until I finished. I think I liked the part where she's actually going mad the best. The "technical" or "medical" part was so fascinating to me that I actually made notes about stuff, haha. It's silly I know. But I completely agree with you on the last third of the book. It's kind of amazing how everything turned out and what good actually came out of her situation. Like I said. I was fascinated by the story, by the book and the way it was written. I don't think I ever read anything like it before. That sounds like a great book. I can't imagine how scary it would be to go through something like that. I really enjoyed this book! I found a lot of the medical parts to be really fascinating, just reading about how complex our bodies can be. However, it was too much for me during some parts. I can't even comprehend that kind of experience. I had a very mild in comparison health problem earlier this year and spent about 2 months visiting different Drs. and getting blood drawn only to have a kind of, "eh, sometimes we don't have an answer" result. That experience frustrated me more than I can even say, but it was nothing in comparison. I loved how she used her experience to help other sufferers and their families. I would definitely recommend this to others with the caveat that there was a bit of profanity that I wasn't fond of. Overall, I think it was a win for the book club! Sorry this is late, but....I thought this was a great read, and definitely not a book I would have read on my own (yay for Book Club!). Unlike last months book, In Cold Blood - that I couldn't put down, this was a little tough to read at times, because I felt it got a little dull here and there with some of the medical facts and I didn't feel like it flowed very smoothly in the sense of telling a story. I think this was mostly due to the fact that Cahalan herself couldn't remember the majority of her 'month of madness' and had to rely on family and doctors to fill in all the pieces. But, in the end, I really enjoyed it because I agree with Bonnie that it is a story of redemption. I actually graduated in Medical Laboratory Science, and used to work as a Medical Technologist in an Immunology lab testing people's blood and spinal fluid for autoimmune diseases. So, when it turned out that Cahalan was suffering from an autoimmune disease I was fascinated. As I was reading, there were times I felt like I was back in my immunology or physiology lectures learning about antibodies and how the body works. I enjoyed this learning aspect of the book, but even for me it was too much at times. Although I think most of the medical facts were important to understanding the disease and what Cahalan went through, I do feel that the storytelling suffered and got lost a little bit in all the lectures. In the first third of book as Cahalan is going mad, I just kept thinking how scary that would be for her family and friends to essentially watch her losing her mind and her ability to function as a person. But I was impressed by the underlying theme I found throughout the book of the incredible support and love from Cahalan's family, and boyfriend. What a tough situation, to have no answers and to not know what was going to happen to this person you care so much about. I thought it was really neat that just the mere presence of Stephen would calm Cahalan down. Even her 'subconscious self' knew what an awesome guy he is. I loved reading about the times when Stephen or Cahalan's dad would see 'the real Susannah'. They never gave up on her. I was also reminded throughout this book how complex our bodies are, and how little we know about them. I found myself in shock that this only happened five years ago, and they knew very little about this disease. There is still so much science hasn't discovered about the brain and the body. Like Bonnie, I also like the quote: 'The girl in the video is a reminder about how fragile our hold on sanity and health is...'. But how thrilling that Cahalan recovered and was able to go back to work and her normal life. I can't imaging living with the thought that my body could start attacking my brain again at any moment. I think Cahalan is awesome for turning her horrible situation into one where she can teach and inspire and encourage others. Overall, a great book. It is educational, intriguing, and thought-provoking. Thanks! I'm excited for next month! As usual, I'm a day late and a dollar short, but I just finished the book last night. Honestly, I loved it. I work in the medical field, so the mysteries of the brain have always been intriguing to me. I've also seen the other side of psychosis, but I found it fascinating to know what was going on inside a person's mind that was "fractured," as she put it. I thought the support from her entire family, friends and coworkers was profound, and I thought it was a testament to her personality that everyone believed so strongly that she would return to herself. The part I actually disliked the most was the third part about her recovery. Her descent into madness was given with such detail and chronology, I was a little disappointed with the description of her road to recovery. I felt that she left the reader in the dark a little bit, going from being unable to walk naturally to dancing at a wedding? It all just fell off a bit for me there. All in all, I thought it was an enlightening and interesting book. I'm glad I joined in, even if I didn't get done in time!